Golf knickers harken back to a golden age of golf. The days of Bobby Jones, Walter Hagan, and Gene Sarazan. If people consider them "vintage," "retro," or "classic,"—well, that's because they are. These short pants (or knickerbockers, "plus fours", breeches, etc.) have been around since at least the 17th century, when Dutch colonists in the American colony of New Netherland (which stretched from what today is Maryland's Eastern Shore all the way up to the bottom of Cape Cod) wore them so much that the breeches came to be known as "knickerbockers," after the surname of a prominent Dutch family of the day. Once they were capable of putting on their own pants, boys would finally transition to shorts or breeches, which were still more accommodating to multiple tailored alterations than slacks or trousers. This so called stage of "breeching" was a significant rite of passage for boys, as it signaled a major transition towards adulthood. Once boys became men, they relinquished shorts, breeches, and knickers altogether in favor of long pants. That is why these Dutchmen who regularly wore breeches stood out even to their contemporary colonists—it was unusual for grown men to wear anything other than long pants. While gentlemen proper may have worn long pants, the utility of breeches was not lost on sportsmen of the day. Knickers and breeches of various cuts and styles were adopted by cyclists, hunters, skiers, golfers, and other outdoorsmen. In fact, the first organized baseball team ever to wear a uniform was the New York Knickerbockers in 1842. While knickers had gained traction among niche markets throughout the 19th century, their adoption in mainstream fashion didn't happen in the US until 1924, when Edward VII, Prince of Wales (and later King of England), wore them on a diplomatic trip to the United States. Knickers had become popular in the UK following the conclusion of the First World War. During the Great War, British cavalry officers wore breeches which bloused over their riding boots, creating a loose fitting pant through the knee, while snug boots prevented the fabric snagging or dragging in the mud. When the soldiers returned home—cloaked in victory and sporting this casual, baggy look—the aesthetic took Britain by storm. In order to replicate the soldiers' look, tailors and clothing manufacturers began selling "plus fours," so-called since they were made four inches longer than traditional knickers of the time. The extra length created that baggier look not found in traditional knickers, which would have laid more or less flat against the leg, compared to the loosely draped look of the plus fours. Not only did they look baggier, but they also felt baggier to the wearer. This allowed for better range of motion and general mobility than other pants of the time. While athletes today are comparatively spoiled by advancements in textiles that allow fabrics to give and stretch, wicking moisture all the while, turn of the century golfers had no concept of "active wear" as we know it today. As such, golfers embraced the additional mobility, and the look remained popular among golfers even after the style waned among the general public waned in the 30's. 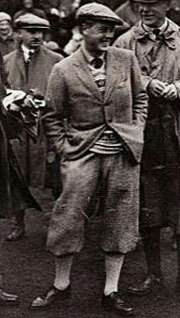 A classic combination for hitting the links during the time was knickers complemented by knee-high argyle socks. A button up shirt and tie covered by a pullover sweater completed the look. Knickers have all but disappeared from modern golf, not to mention mainstream fashion. While golf has all but abandoned knickers, they still live on in other sports, most notably (American) football and baseball where players still wear knicker-length pants. Football officials still wear them as well in cooler weather. In golf, some stalwarts remain, proudly standing apart from the de facto golf uniform—the polo shirt and some pants. (It was this uniform look that led the late Payne Stewart to don plus fours at the beginning of his professional career.) In standing apart from the crowd today, golfers who adopt the traditional look of golf knickers also pay homage to the early days of modern golf, and the rich history and tradition of the game as a whole.